Before we went to New Plymouth (for Mt Taranaki), we visited Huka Falls. A friend of mine already went here and she suggested us to visit as well. At this point, we already had several waterfalls like Whangarei Waterfalls, Mangawhero Falls and Rainbow Falls. I'm getting used to it. Although these waterfalls are very good and very unique from each other, they are still waterfalls. But since Huka falls is just a quick stop, we decided to visit this place. We are not disappointed. If only I have a good working quadcopter with me, I'd explore this area near the waters! It's just off from Taupo (7 minutes drive). But if you're going straight to West Coast from Taupo, it's best to maximise the trip and see as much place as you can (if possible). I believe this is a 4-5 hours trip but we went to 6 hours since we're driving leisurely and taking photos at Forgotten World Highway. 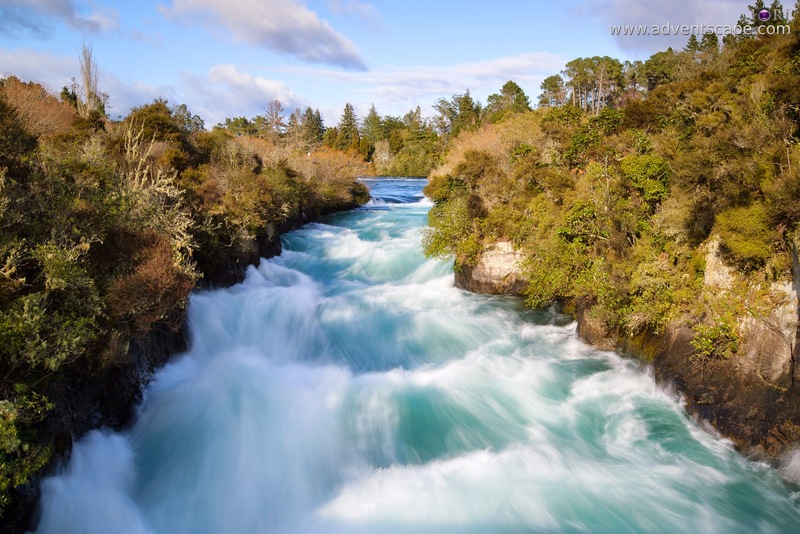 What makes Huka Falls different from other waterfalls? It's a short adventure to see the raging waters. Huka Falls parking lot is vast. I'd say, it's easy to find parking here. 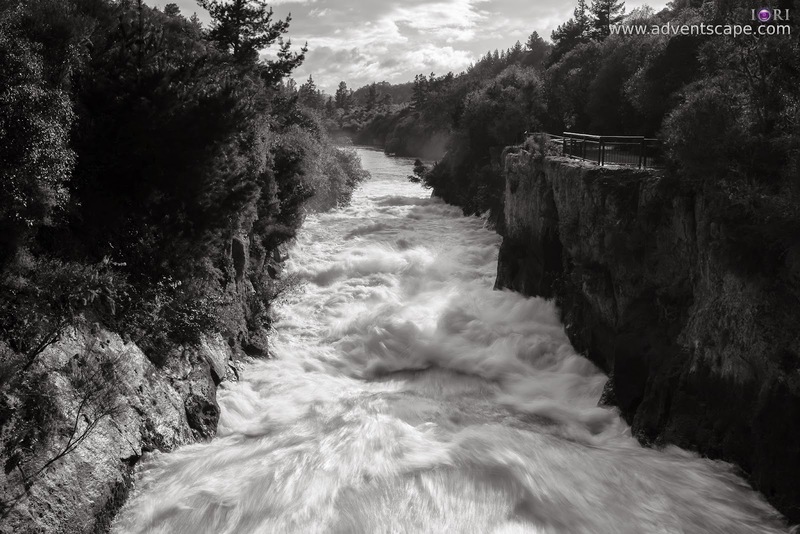 Once you get off your car, it's just about a minute (or 2 minutes) before you get your first glance of Huka Falls. At the time of our visit, the waters are fierce. It's probably due to the constant rain days before we arrived here. 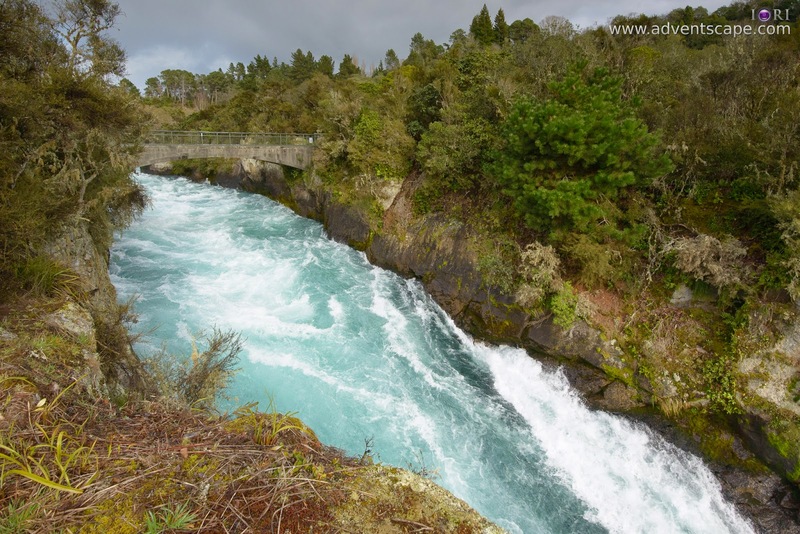 Huka falls is also a narrow passageway from both wide areas - thus the waters need to squeeze and flow faster in order to have the same volume of water flowing. Zoom into my map and you'll see. I went immediately at the ‘main entrance’ of Huka Falls. I went straight to The Bridge (Vantage Point 1). You’ll notice the water rushes violently as it passes towards the basin. Look at the photos that I took at how strong these waves are. You can hear the waters splash against the walls of the rock. There are several vantage points before you arrive at the big basin at the end. Vantage Point 1 is the actual bridge itself. You can take a photo either at the left or right hand side. Both sides will give you enough depth on how strong the currents are. 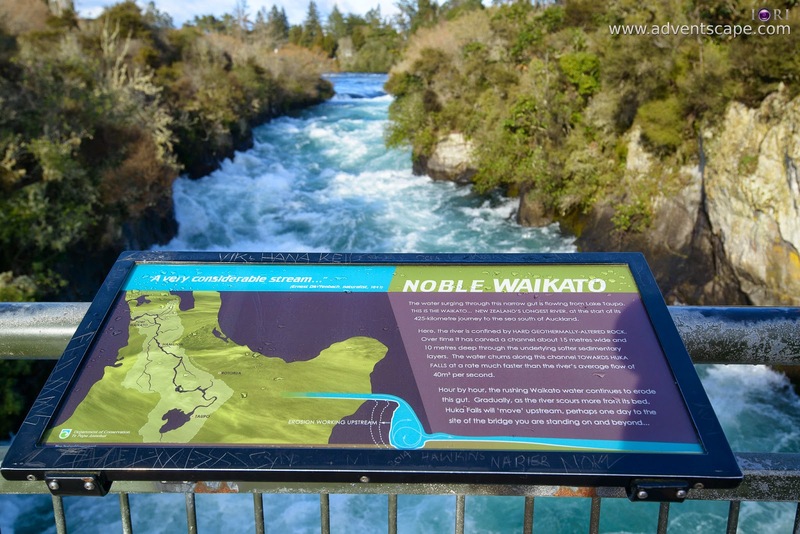 The right path goes to Spa Park - Huka Falls Walkway. I didn't do the walk as it's 1 hour return. I just went left. This goes to Huka Falls Viewpoints and it only takes 1 minute. The vantage points do have protective railings in them. Though it prevents you from accessing further, it doesn't prevent you from going over the railings. I did not try going over this fence – I stayed safe. Vantage Point 2 is just over the top of the waterfall. Walking further beyond Vantage Point 2, you’ll end up at the left side of the waterfall. This area widens and the waters begin to calm. You'll notice the path still goes through the woods. This goes to Aratiatia Walkway going to Aratiatia Dam. Again, we didn't do this walk as it's 2 hour return. We need to conserve time so we can go through the long drive to Forgotten World Highway. When Ado and I went back at the parking lot, I could not find one of my friend, William. He again drifted somewhere I suppose. Ado and I tried to find him but could not. After several minutes of waiting, William emerges. He was checking out another vantage point which is at the opposite side of the Huka Falls. 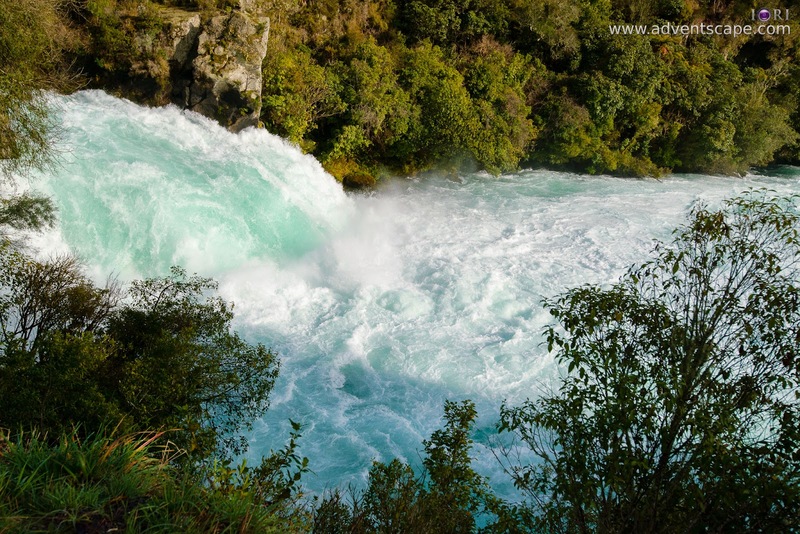 So if you’re facing Huka Falls, it’s at the right side – refer to Vantage Point 4. 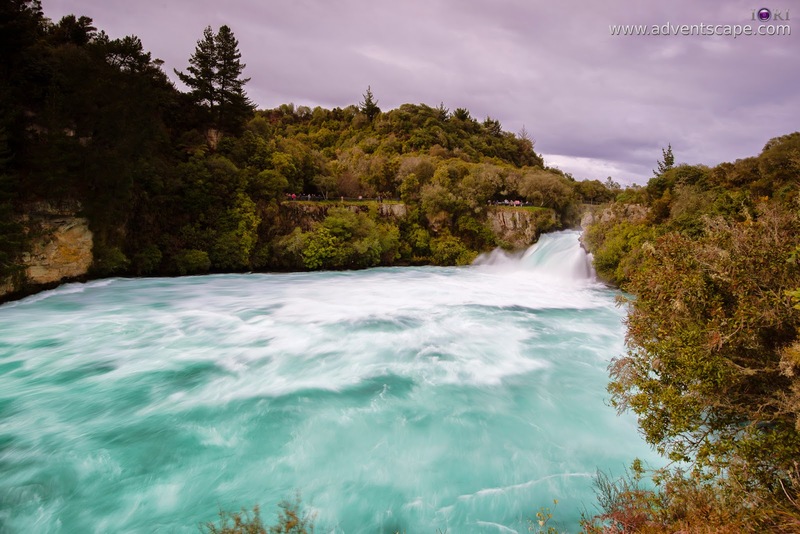 From the car park, walk towards the main entrance of Huka Falls. Instead of entering, walk yourself towards the left until you see a passage. Unlike the main vantage points, this passage is bushy, not cemented and you need to walk further before getting a view. This area is wide and grassy. If only I have a quad copter with me, I can take it off here and fly over Huka Falls. Since the basin is a wide area on itself, you can have the quad copter fly over the waters. That is, if you're confident enough to fly. Huka Falls is just amazing. Among the waterfalls I've seen so far, this has the fiercest waters. Since it's just 7 minutes from Taupo, there's no reason not to visit if you're already there (or staying for the night). If you come in early, there is The Hub Cafe, have breakfast and enjoy the visit!